The Universe (and Life within it) turns in cycles. Galaxies spin around the Universal Center. Solar systems spin around the Galactic Center. Planets spin around the Sun. This is a trend that has become quite obvious over the past few years. More and more geeks are standing up and shouting out their pride in being what they are. It's actually quite heartwarming to see this once neglected and ridiculed section of Society finally getting the acknowledgement and recognition they deserve as human beings. Brings a tear to this geek's eye. But there's a problem- a problem that occurs with EVERY trend that catches the public attention. That problem isn't haters- since geeks are used to their derision. The problem is that some people are simply claiming to be geeks to seem cool. You see them on the internet pretty much every day. People who think that putting on a pair of glasses, holding an X-Box controller, and claiming that M. Night Shyamalan's "The Village" is a deep cinematic exploration about how people (and Society) create fictional realities in order to escape the hardships and pains of their lives, makes them geeks. People who quote "Big Bang Theory" and ask, "Who would win an argument: Mr. Spock, Data, or Sheldon Cooper?". People who post pictures of themselves on Facebook making ducklips and gang signs. Oh, wait- no... that last one just means they're stupid, not geeks. My bad. You can tell real geeks from the poser geeks quite easily. Real geeks don't really draw attention to the fact that they're geeks, and often look like normal, everyday people. Poser geeks on the other hand, tend to act and look like the stereotypical image of what a geek should be... and they often get it wrong- looking more like nerds than geeks. The biggest difference between real geeks and poser geeks is the fact that real geeks aren't being geeks to be cool. They're doing it because they simply ARE geeks. Geeks are really passionate people when it comes to their areas of geekness. This passion is seen in the care taken in the cos plays they do for conventions (even the bad costumes), and the attention to detail they bring to their star ship designs. Geeks actually read and enjoy, and discuss, and look deep into the comics and books they read, and the movies and anime they watch. They are experts in their chosen fields of interest, and are able to distinguish between a "Star Trek: The Next Generation" season one uniform, and a season three uniform. They can tell you who designed, and crafted the various fedoras used by Harrison Ford in the Indiana Jones movies. Real geeks are also very loyal to each other, and their hobbies- and will defend their honour with sharpened bath'leths and Klingon fury. Even when they series their favorite TV series, movie franchise, or comic series going down the toilet, they will hang on in the hopes that things will get better again. They are also very spiritual, and will prey to the Great Bird of the Galaxy, or commune with the Force when their faith weakens. Poser geeks can only dream of achieving the level of passion and dedication that real geeks have. After a short while, the poser geeks will find some other shiny bauble-like band wagon to jump on in their continuing quest to be cool and popular. Learn this lesson from the geeks (being given by a geek no less) if you honestly want to be cool- don't try to be something you're not. Just be you. *giggles* What about those of us who adore the Geeks but are not really a geek themselves? 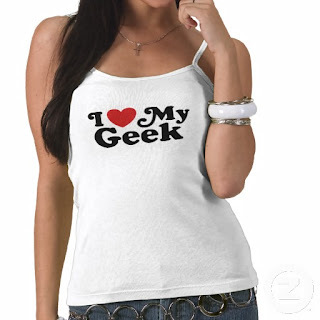 I was called a geek once...by someone...I replied with..I am just me. Not popular, not cool, not smart enough to be called a geek or a nerd either. Just me. Oh pfft, Why Can't I be a poet geek? err, well is that even possible? haha I love music but so do many others and I bet millions much better than I am with it. I prefer my poetry and my rambles but they are not as easy to gain an audience for. Music is just easy.I am not a geek. *rolls eyes* Find someone to agree and I'll stop arguing. Maybe.